The piracy liability lawsuit between a group of RIAA labels and the Texan ISP Grande Communications is heating up. The ISP is in a tough spot after Magistrate Judge Austin recommended to drop its right to a safe harbor defense. The company disagrees, and asks the court to leave the safe harbor decision for trial, pointing out that Rightscorp's piracy notices can't be trusted. The “repeat infringer” issue remains a hot topic in US Courts, leading to much uncertainty among various Internet services. Under the DMCA, companies are required to implement a reasonable policy to deal with frequent offenders. This requirement applies to hosting services as well as commercial Internet providers. Previously, Internet provider Cox lost a legal battle over this very issue, and major record labels are currently going after the Texan ISP Grande. In order to enjoy safe harbor protection, the DMCA requires ISPs to adopt and reasonably implement a policy for terminating the accounts of repeat copyright infringers. According to the labels, it is clear that Grande failed to do so. As such, the company should be held directly liable. Last month, US Magistrate Judge Andrew Austin sided with the labels. In his report and recommendation, he concluded that Grande had a policy that allowed it to terminate repeat infringers. However, the ISP failed to act on this for years. As such, the policy was not ‘adopted’ and ‘reasonably implemented’. If the court adopts this recommendation, the ISP won’t have a have harbor defense at trial, which would be an enormous setback. However, in an objection filed this week, Grande hopes to convince the court to have the matter decided during trial. According to the ISP, there is more than enough evidence that would lead a jury to conclude that Grande qualifies for a safe harbor defense. While Grande doesn’t deny that it initially didn’t disconnect any repeat infringers based on Rightscorp’s notices, it doesn’t believe this was wrong. First of all, Grande points out that the DMCA’s text is rather vague on what a repeat infringer is and when disconnections are appropriate. This issue has also been brought up in the past in other cases, including Cox’s lawsuit. In addition, the ISP has serious concerns about the reliability of Rightscorp’s piracy notices, which also contain settlement demands. Grande notes that there are critical flaws in the Rightscorp system. 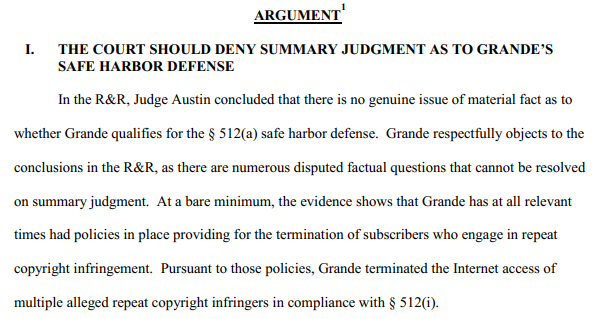 These create factual disputes as to whether Grande should have terminated the Internet access of any subscriber, which it would like to present during trial. “For instance, Rightscorp’s notices do not identify the name of a copyrighted work or a U.S. copyright registration, and they contain no explanation or evidence of the factual basis of the allegation,” Grande writes. The ISP believes that during trial, a jury could come to the decision that Grande didn’t have to act on Rightscorp’s notices to keep its safe harbor. The argument boils down to what ISPs are required to do when they receive notices of alleged infringement. Are third-party accusations good enough to classify someone as a repeat infringer? Judge Austin concluded in his report and recommendations that Rightscorp’s notices should be acted on, adding that Grande initially didn’t terminate any subscribers based on other notices either. However, in the past, many ISPs had a similar policy to Grande’s, with some even arguing that only a court can declare someone an infringer, not a simply piracy notice. While Cox failed to convince the court with similar arguments in the past, Grande stresses that its case is different. It, therefore, calls on the court to reject Judge Austin’s recommendation and jet a jury decide what’s appropriate. “In sum, it is axiomatic that determining whether Grande failed to implement a policy for terminating repeat infringers ‘in appropriate circumstances’ requires considering the evidence of the actual circumstances. “That evidence includes the extensive evidence that Rightscorp’s system is simply incapable of reliably identifying and giving notice of actual copyright infringement. At a minimum, this evidence gives rise to a genuine issue of material fact for trial,” Grande concludes. A copy of Grande’s objections to the report and recommendation regarding the DMCA Safe Harbor defense is available here (pdf). In a separate filing (pdf), Grande objects to Judge Austin’s recommendation to deny summary judgment in the ISPs’ favor on a variety of liability issues, including direct infringement, willfulness, damages, and ownership of copyright. These are all under recommendation to be denied, except for two limited issues regarding the alleged violation of reproduction or public performance rights. The record labels, for their part, also object to the recommendation but ask the court to deny summary judgment for reproduction as well (pdf).